The California primary is June 7h and the field has shrunk to the point that I have enough bike gloves to lend to the candidates if they need them. 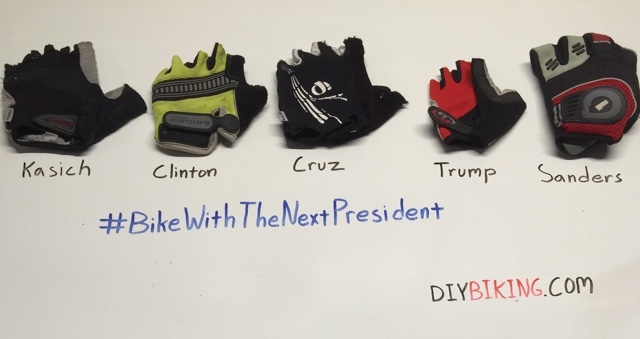 So, Ted Cruz, John Kasich, Hillary Clinton, Donald Trump and Bernie Sanders: I want to #BikeWithTheNextPresident. Come to San Jose and we will take a short, no political bike ride together. The press will eat it up and you'll have fun before heading to some stuffy fundraiser. Cycling brothers and sisters: share this image far and wide and ask the candidates to go biking with you, too. If the #LetTheInternetNameAnimals / Boaty McBoatface thing can go viral, this can too. Thanks for reading and thanks for riding.